Khufu - The second pharaoh of the Fourth Dynasty (Sneferu being the first), Khufu has the distinction of being the builder of the first of the "Big Three" pyramids; The Great Pyramid. 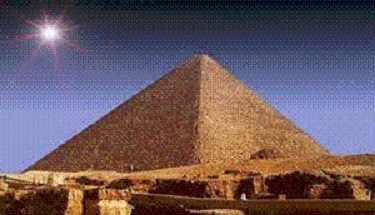 The only one to be designated as one of the Seven Wonders of the Ancient World (many mistakenly believe the wonder consists of all three pyramids). As with Djoser, the length of his reign is in dispute. The Turin King List puts it at 23 years. Herodotus says 50. And Manetho knocks it all the way up to 63. And still another inscription found in Khufu's own pyramid indicates a reign of about 34 years. Dr Zahi Hawass has authenticated the inscription, so perhaps it is the most accurate. Interestingly, despite having the largest monument in all Egypt built in his honor, the only complete image of him that survives intact to this day is a three inch statue (the one you just clicked on).